Eyes should get exercise just like any other part of the body. Attached to our eyeballs are six little muscles that can be tonified. Eye exercises can also increase circulation to the eye area. Acupressure on the feet can benefit the eyes, especially if you pay special attention to the bottom of the second and third toes. If your eyes need some extra help, you may want to massage the correlating reflex points at the base of the bottoms of the second and third toes in a firm circular motion. Eyes should get exercise just like any other part of the body. Attached to our eyeballs are six little muscles that can be tonified. Eye exercises can also increase circulation to the eye area. When reading or focusing for long periods, squeeze your eyes shut for a few seconds to increase blood flow to the area, If you spend your days looking at close objects, every half hour, take a break and gaze off into the distance. It truly is worth the time to improve circulation and strengthen the muscles attached to the eyes to keep them in working order. Keeping your head still, look up and down 7 times. Close your eyes and rest 10 seconds. Look from one side to the other 7 times. Close and rest 10 seconds. Look diagonally from one direction to the other 7 times. Close and rest 10 seconds. Look diagonally from the opposite direction to the other 7 times. Close and rest for 10 seconds. Roll your eyes in an upper half circle and back 7 times. Close and rest for 10 seconds. Roll your eyes in a lower half circle and back 7 times. Close and rest 10 seconds. Place the backs of both hands over closed eyes and rest for a full minute. Another simple way to exercise your eyes is to hold a finger or pen 10 or 12 inches (25.4 or 30.5) away from your face, focus on the tip, and then look off into the distance. Turn your head from side to side as if saying no emphatically. Repeat several times. Acupressure on the feet can benefit the eyes, especially if you pay special attention to the bottom of the second and third toes. If your eyes need some extra help, you may want to massage the correlating reflex points at the base of the bottoms of the second and third toes in a firm circular motion. Deep massage at the base of the neck may help to relieve tension that impairs vision and can considerably prevent diseases in your eyes. If you spend your days in front of computers, keep the lighting in the room low with screen brightness three to four times that of the room. Consider using full-spectrum lighting in the home and workplace. 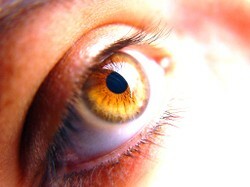 Natural light improves visual acuity and helps prevent eyestrain. Consider getting some healthy and organic food for your eyes. Minimize glare by keeping monitors away from light sources such as windows. Consider using an antiglare screen. Make sure characters on the screen stand out sharply. Have the screen positioned 14 to 20 inches (35.6 to 50.8 cm) away from eyes just below eye level. The colors of display characters on a computer that are easiest on the eyes are amber and green. Fifteen minutes out of every hour, try to do some non computer sort of work. When it is safe and can be done without strain, try to spend a few minutes each day without anything covering your eyes (glasses, sunglasses, or contact lenses). Close your eyes and allow the sunlight to rest upon your closed eyelids for 3 to 5 minutes. Another beneficial eye strengthening technique is called “sunning.” It is done by standing or sitting with closed eyes (though no glasses or contacts). Then move your head slowly from the left to the right, allowing the sun’s rays to gently cross over closed eyes. This is best done outside, preferably when surrounded by the calm, cooling, healing green colors of nature. An ancient folk remedy to benefit the eyes is to gaze at the cooling rays of the moon!